This is one of our smaller size chimes. It measures 21″ long. It is nice when you want to simply send a small gift in remembrance . 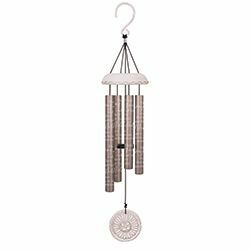 Our Vintage White Chimes are made from high quality polyresin, aluminum and industrial cord. The tubes feature a durable anodized finish and display a popular sentiment. Adjustable Striker.